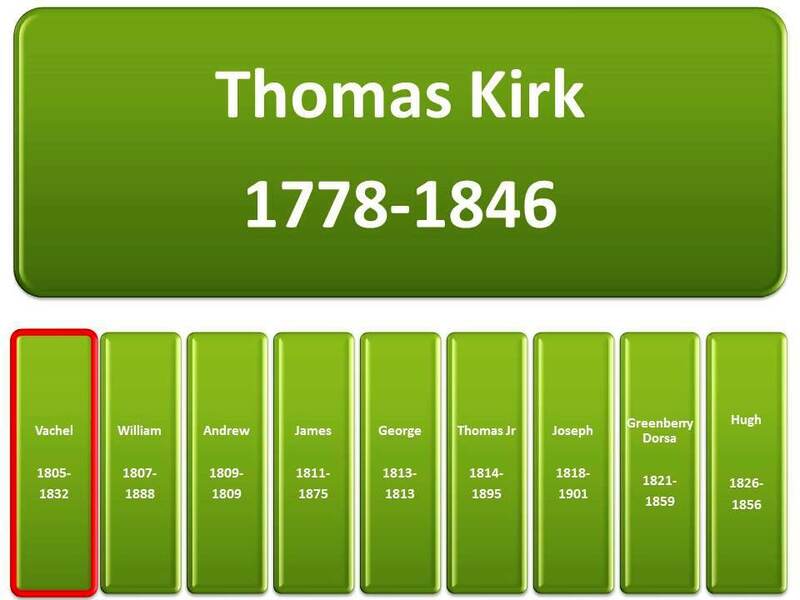 This past summer, I traveled to Licking County, Ohio and visited the cemetery grounds where my fifth great-grandfather, Thomas Kirk, was buried. Walking among the crumbling markers, I found a weathered footstone inscribed with the initials "V. K." It was the last physical remnant of my fourth great-grandfather Vachel Kirk's burial. Thomas was accidentally killed when he was about 68 years old, and his son Vachel died at the age of 27. Both deaths made me curious about my patrilineal longevity. 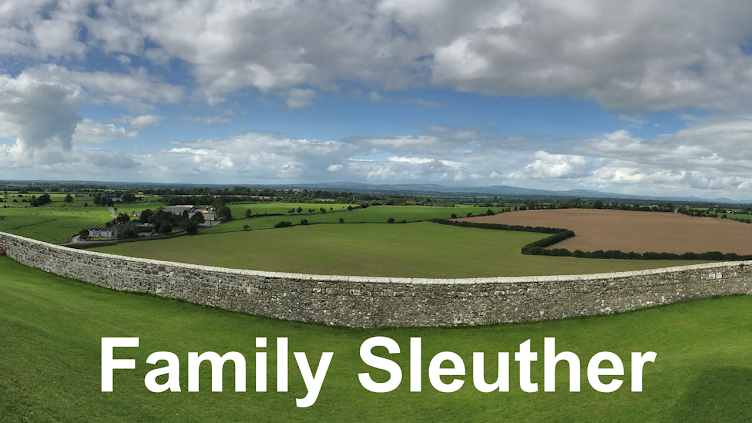 How old did my paternal line ancestors live to be, and were there reoccurring causes of death? 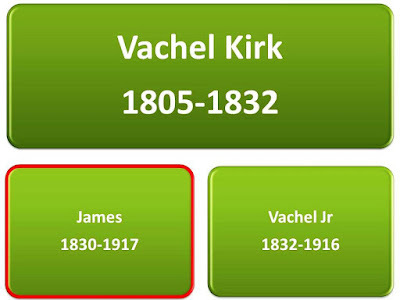 Vachel was the eldest of Thomas' 13 children and one of nine sons. When Vachel passed at 27, he had three children who survived him, including two sons. My third great-grandfather, James Kirk, lived to be 87 years old. He passed away in Iowa's Polk County Asylum from acute intestinal infarction. In 1917, his name appeared on the Asylum's rolls of the insane; first appearing in April when he was committed to the facility. I suspect, in his old age, his mental faculties must have faded and the family had to relinquish care to medical professionals. See Grandpa Reappeared In The Insane Asylum. James had eight children, including five sons. 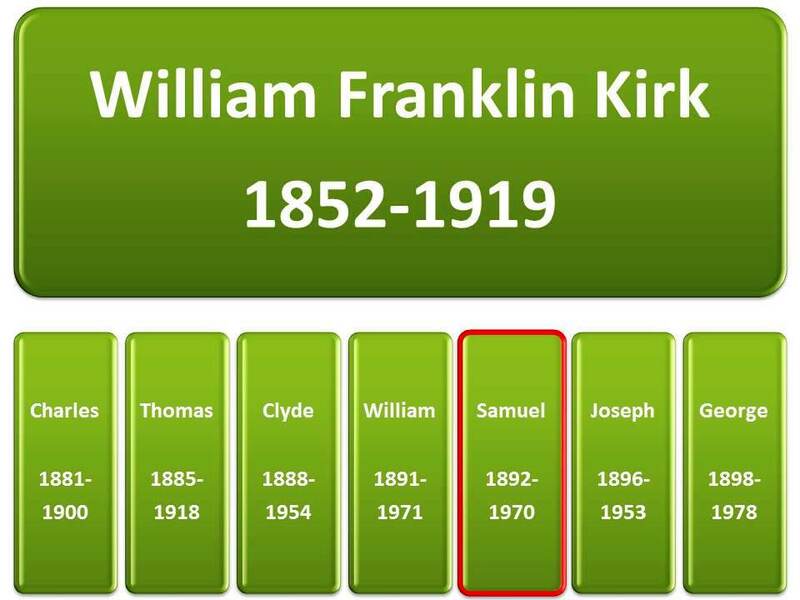 Among them was my second great-grandfather William Franklin Kirk. William settled in Colorado and worked at a water reservoir. 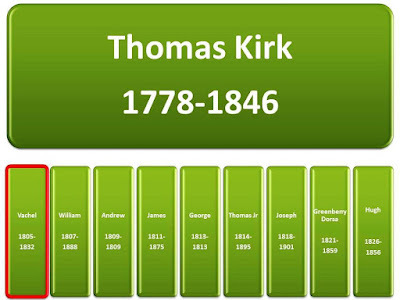 In 1919, at the age of 67 (nearly the same age as Thomas Kirk when he was accidentally killed) he was found face down in the reservoir. His death certificate listed accidental drowning as the official cause of death. See Night Watchman Found Drowned. 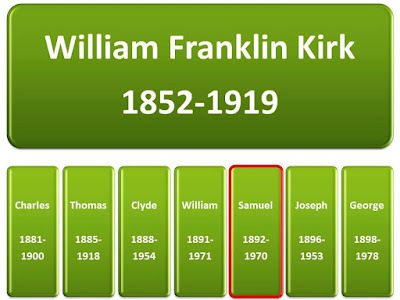 William was father to 12 children, including seven sons. 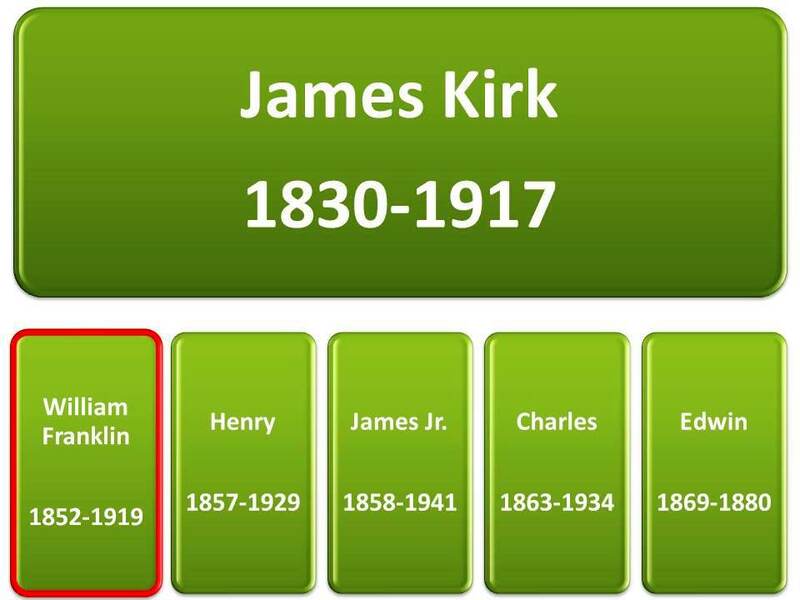 My great-grandfather Samuel James Kirk was among the middle children. Samuel enlisted in the military during World War I, and spent his final months living in a Colorado Veterans Administration hospital. He died in 1970 at the age of 78 due to chronic brain syndrome. Samuel's only child - my grandfather - passed away in 1990 at the age of 58 following a heart attack. Tallying their ages: 58, 78, 67, 87, 27, and 68, results in an average life expectancy of 64 years. When laid out in this fashion, it's interesting to see that the scattered ages - skewed by accidents and an early death - aren't the result of a single reoccurring cause of death. These average ages skewed low - even for these time periods - because of the inclusion of the higher childhood mortality rates that existed pre-20th century. I've seen life expectancy charts where the numbers increased for men who made it to the age of ten. If you could survive the afflictions of childhood, you were likely to live a moderately long life even by today's standards. 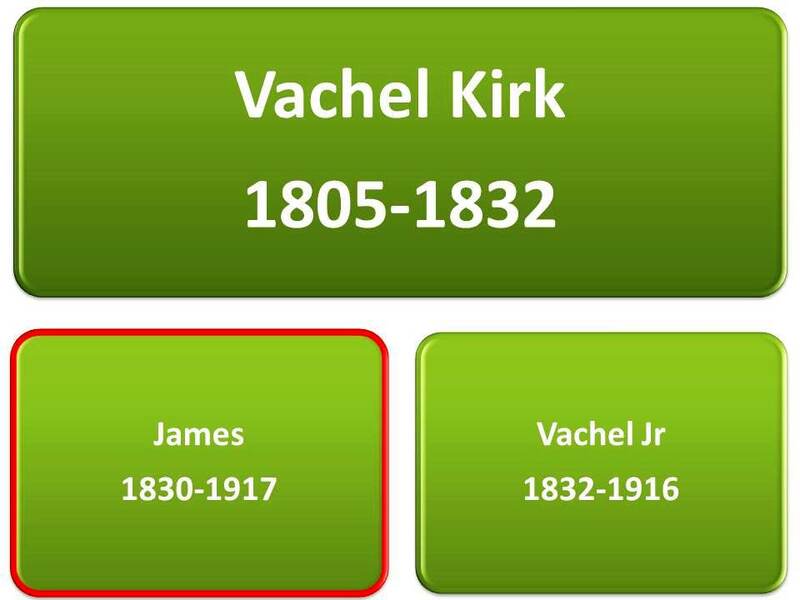 While none of them were centenarians, my paternal ancestors - excepting Vachel - all beat the life expectancy rates for men born in their generation. Hey, celebrate every victory! How did your ancestors fare? Did you average them without the accidental deaths? That would give you a more realistic sense of actual longevity, wouldn't it? I haven't done this. Not sure I want to know! You make a very good point (for which I did NOT account for). So, removing my greatest outlier (4th great-grandfather who died at 27) but still keeping the accidental death for Thomas I get an average age of 71.6, which isn't that far below today's life expectancy for an American male of 78.74 years. Not too bad at all! I hope you, however, bring the average WAY up! :) Merry Christmas, Michael.